Indy loved life. He loved hunting, his family, and he was happiest when he thought he was pleasing you. Indy was our little love-bug. He had the sweetest temperament, and much like his father, Barry (Ch Classic Barry Bakanal CDX ROM), when disciplining, just a gentle no was sufficient. Indy finished his conformation Championship quite easily. Along his path he won 3 Majors and a Best of Breed! He started showing at 10 months old and by the time he was 15 months, he was a Champion. It’s not usually that easy or quick, but Indy exceeded our expectations, as he always did. In the field, Indy was a great little hunter. He would look up at you with such anticipation as he waited to be released to “hunt ‘em up.” Once given the command, he ran with intensity, with his little tail flagging away as he tracked. He had a beautiful, strong point, and the desire to please. His mouth was so soft, that if the bird was still alive when he reached it, it would still be alive when he placed it in your hand. The same applied to stray tennis shoes left around the house, which he always greeted us with when walked in the door. Indy was never trained in the field with an e-collar, just the thought of disappointing you was enough to keep Indy in line. Indy’s field training was inconsistent at best. A year off between his first Senior leg and his last three. Then only about 15 hours of practicing for Indy to complete his Master Title. We were blessed with Indy; he was such a natural hunter and learner. Until the day he died, Indy still loved hunting more than anything and never lost his sense of smell. He was truly a great bird dog. When we brought Karma home, it was time to give Indy some special time on his own. Jenny decided to try her hand at Rally with Indy. They started by doing the foundation work at home: sit, down, wait. Classes were taken and new steps were added to the repertoire: come front, swing side, come around, and turns. A few more classes and Indy was ready. Jenny handled Indy to his RN (we joked that we had a Nurse and a Doctor in the house) earning their personal best 92 along the way! Since he had these new-found skills, we tested him for his Canine Good Citizen certificate in 2011, and he passed on his first try! Then it was back to Rally in October of 2011 to see if we could get Indy’s Rally Advanced title. Indy was an amazing boy and not only passed in three consecutive tries, but he earned 2nd place every day and even a high score of 96! Indy finished up his Rally career by completing his RE title in June of 2012. He picked up his first leg in January with a 3rd place finish, then qualified in 1st place for the last two legs. 2011 was also the year we dove into coursing. Indy’s favorite part of his day was getting to chase bunnies on our daily off leash run, so we had a premonition that he would be great at coursing. Sure enough, Indy passed in three back-to-back-to-back Coursing Ability Tests to earn his CA (coursing ability) title. Who knew his rabbit chasing skills would ever earn an AKC title! After Indy finished his Rally Excellent title in 2012, we set our sights on competition obedience. We started taking classes with Sarah Stremming (Karma’s agility trainer) because we love her positive reinforcement approach. It was hard to find a class that wasn’t centered around negative reinforcement/pain compliance, like ear pinching. Indy was very “soft” (like a lot of Vizslas) and we knew negative training techniques would shut him down. Needless to say we were so thankful to find Sarah’s class! Our goal was to be ready for the 2013 Vizsla Club of America National Specialty, and we were! Indy went 3 for 3 over just as many days to earn his Companion Dog title — with 3 blue ribbons to boot! 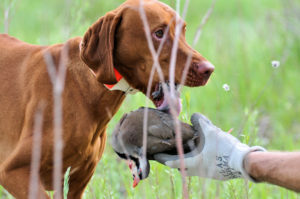 Since Indy was already both a Champion and Master Hunter, his CD title qualified him for a Versatility Certificate from the Vizsla Club of America! In 2015, we tried a totally new venue with our old man (11 years now!) called Barn Hunt. In Barn Hunt, the dogs have to find and indicate a tube with a rat in it, and there are tubes filled with rat litter too, so their nose has to be on! Indy loved it and passed the instinct test to earn a RATI after his name. Barn Hunt wasn’t around often, but we loved finding a new adventure for him to enjoy! Fittingly, Indy’s last title was his therapy dog title. Indy spent several years volunteering at Children’s Hospital Colorado as part of their Prescription Pet Program. He was always such a hit! Being a retired obedience/rally dog, he had many tricks to offer, but perhaps more importantly, he had a git with people. His look was so soothing, so loving, and so reassuring, even the most upset child would usually calm down within a few moments of him being in the room. Indy bought everyone such joy and love, and we were so blessed to have him for 14 wonderful years. To read more about Indy, please click here for his appearances in our blog over the years.